The ID96HFP modem now supersedes the DSP9612 FP-LV-RM and modems and is completely compatible. The IG96HFP is ideal for point-to-point and multi-point polling network with the industry's fastest training time. SCADA, Traffic and the oil industry are only a few of the markets that this cost effective, point-to-point or point-to-multipoint, modem serves and is best suited for leased telecom line applications. 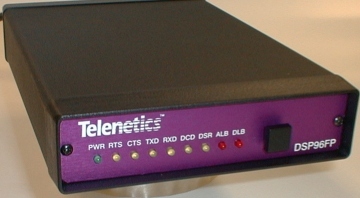 The 23 ms RTS/CTS training time allows multidrop fast polling of dedicated line Remote Terminal Units (RTU)’s to upgrade their speeds from the historic Bell202T modems at 0-1800 bps to 9600 bps.